I woke up inside the mosquito net and thought, as I do every year, that it was going to be a shame to leave that delightful hiding place. And for the first time, I found myself filled with downright resistance. Usually on this morning, I lie in bed and enjoy the mini-world inside the net falling around me, its soft waking sounds and obscured view, and I feel the stretch of my existence from one world to another. The sun peeks under the ruffle of the corrugated tin roof and draws a squiggle in the mirror. The prospect of departure highlights the distance and the miracle of my life’s cartography, and I float for a moment in an expanse of sadness and gratitude. But today the other end of that fishing line felt so far away and tenuous that I just had to get out of bed and not think about it too much. Leaving Aamaa is always the single hardest part of leaving at all. I’ll call from home, but it’s hard for us to chat on the phone. So much of our relationship is a physical presence; it’s moving together in this space. When our communication is reduced to words and sieved through my imperfect language skills it becomes thin and stilted. 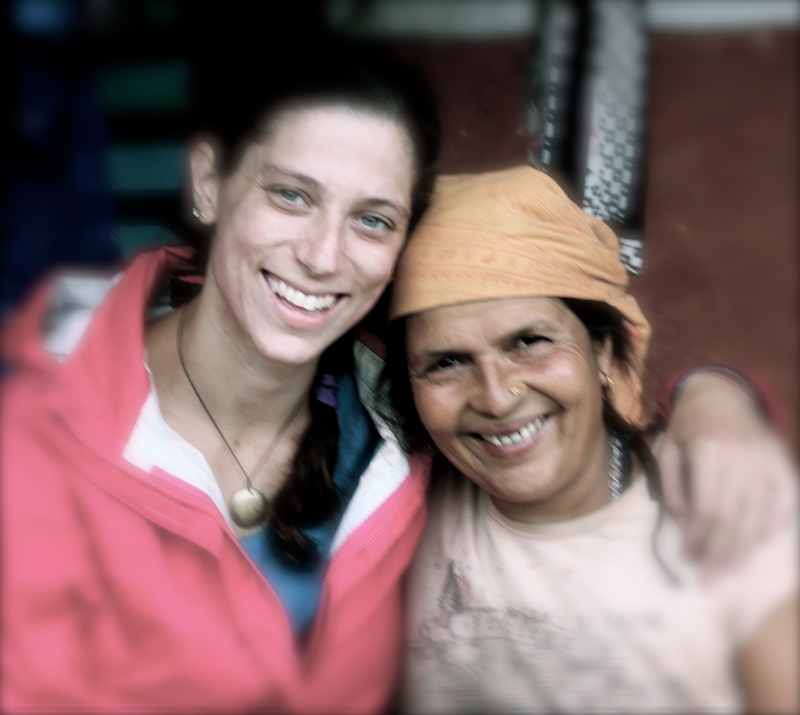 It’s hard for me to explain my life in Connecticut, and to understand life in Kaski through an update over the phone. But even more important is that as I get older, Aamaa and I have a simple and innate perception of each other’s aloneness. So on this morning, we orbit like two electrons, knowing this great force is about to separate us, and it seems like the loneliest thing in the world–because we sense each other’s singularity in addition to our own. Sunrise was grayed out and respectfully subdued. As the clouds gathered, Maya bouju came over and she and Aamaa and I sat on the porch drinking tea. Soon a thick fog had rolled in and I could barely see out past the faded tomato vines in the garden – we were literally sitting on an island of yard inside a cloud. And in that new configuration, looking out at the blankness, I felt the stretch at last. That’s how exactly how it was: the three of us sheltered from the chaotic world in our temporary clearing, putting off the imminent moment when I would have to set down my tea cup and walk back in to the unknown. A year or two ago, Aamaa starting making noises about getting an electric rice cooker. Of all things, right? 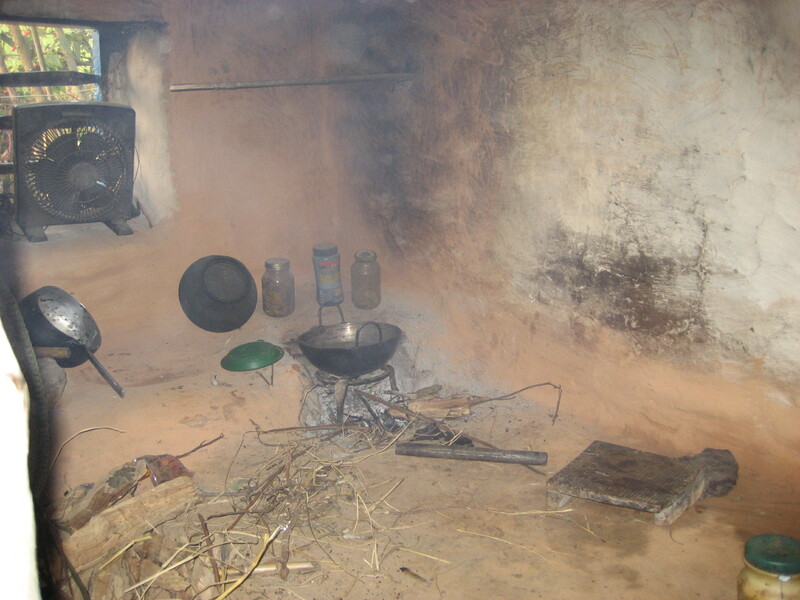 I am constantly baffled by the perceived awesomeness of this contraption in a place with no plumbing, no heat in the winter or A/C in the summer, no political system, and widespread illiteracy, where the one thing that people have been doing for hundreds of years with no problem whatsoever is cooking rice. In pots. And never mind that in the winter, there’s load shedding for up to 16 hours a day. Nevertheless, it is a thing. 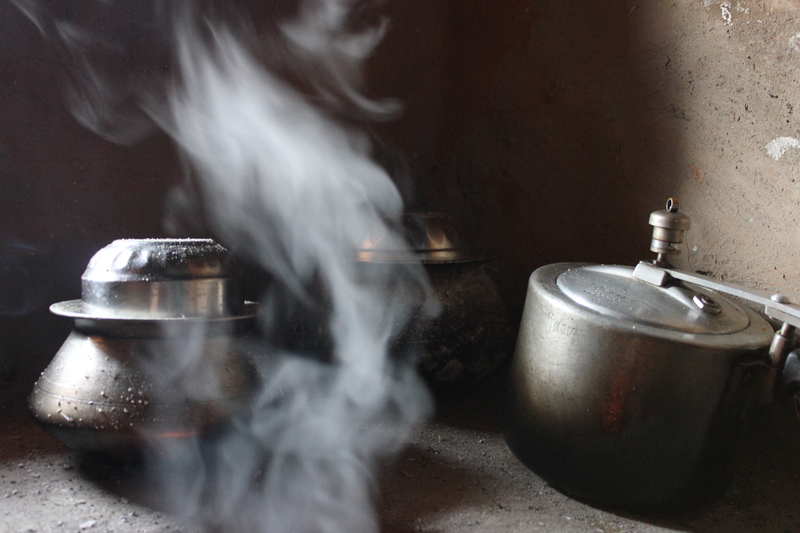 By some mysterious process, the rice cooker has become the iPhone of the rural Nepali woman, just like TVs became standard in Kaski’s mud-and-stone houses when so many kids left the village to work abroad, where they send home just enough money to cover a few celebrity amenities. Now a TV I can understand. But a rice cooker? I used to say that about cell phones – remember how we used to just call each other on landlines? And that worked fine? 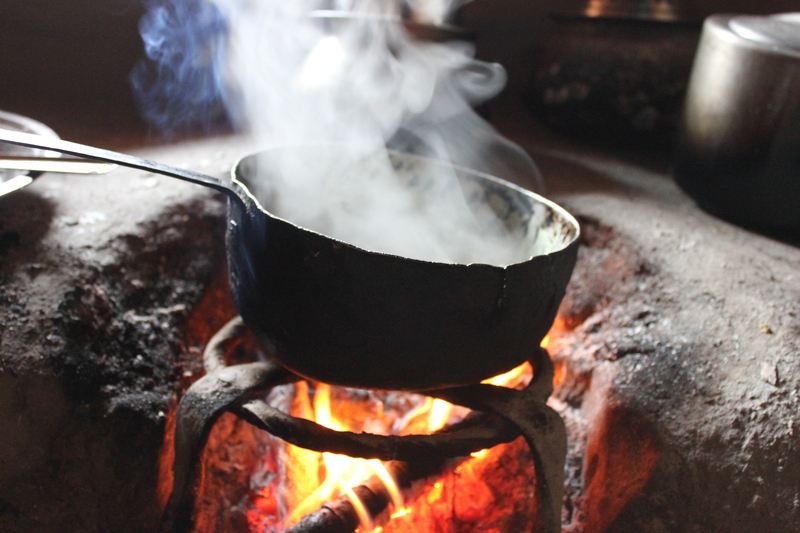 Aamaa used to cook rice in a pot, from 56 years ago until last June. It’s not about whether it’s fine. It’s about having a celebrity rice cooker. So last year when Bishnu was visiting, she picked up a rice cooker for Aamaa. And of course, Bishnu went for a large, impressive looking one – even though Bishnu should know better than that by now. Because first of all, when you put rice for one or two people in a large, impressive rice cooker, you get a wide, unimpressive rice pancake. And let’s not forget that there’s no electricity half the day. So I arrived this year to find that when the electricity comes on, the first thing Aamaa does is rush to plug in the big electric rice cooker. No matter what time of day it is. This is how we have found ourselves eating a room-temperature rice pancake as our 2013 featured dinner entrée. And the thing that blows my mind is that it’s not like Aamaa doesn’t know what hot, properly prepared rice tastes like. It’s the only meal she’s eaten for her entire life. But this rice-cooker-chilled-pancake-system inexplicably retains its a status of superiority in the face of damning evidence that it is terrible. Sometimes life is so strange. I wasn’t sure how serious she was, but the next time I was in Pokhara, I decided to get Aamaa a 1-liter rice cooker. Like the one I have, in Connecticut. I brought the small rice cooker home the other day and we unwrapped it on the front porch. It was like the Second Coming. The fourth beloved grandchild of the family is introduced to all visitors. Aamaa takes it out and points to its dainty circumference and shiny exterior. Then she and I regale the neighbors with stories about the failings of the large rice cooker – it makes rice like a roti, for goodness sake – and swoon over the shimmering, earth-shattering perfection of the small rice cooker. Which is just right for two people. Or one person. Like my rice cooker, in Connecticut. I am so used to Aamaa’s highly technical and nimble mind that it never stops surprising me to run in to the boundaries of her experience. I remember during my first year in Nepal, I got first-grade primers so that Aamaa and I could learn to read together. I started copying new letters and sounding out the phonetic alphabet. It turned my world upside down the first time I watched Aamaa try the same thing and saw that she copied letters slowly and awkwardly like a child. Why wouldn’t she? I sifted grain like a child. The rice cooker more than anything has reminded me that we simply have different types of literacy. Most of Aamaa’s life has been extremely repetitive, and she moves in it with a technical and intuitive agility that I think few people in my world ever have the chance to know – if only because of the much wider range of experiences we have to integrate. I think that makes us more adaptable across novelties and habituates us to thinking relationally; it’s what allows me to look at a new situation or task and decode it or try out variations in my mind. But Aamaa just doesn’t encounter nearly as many new situations in her life, so instead, she knows the ones that are familiar to her with a level of subtlety that maybe only Olympic athletes and ultra-dorky mathematicians ever encounter where I come from. So much so that even the rice cooker, which seemed just a few degrees removed from Aamaa’s mainstream world, turned out to be a static event for her, not something to be adapted or improved the way the millet seedlings can be tended to in the garden. Now I’m trying to get her to use the “warming” feature, so that when dinner gets cooked at 3:06 pm, it stays warm as long as possible. I mentioned this the other day when Aamaa rushed to unplug the cooker rather than leaving it with the warming light on. “Aamaa, it’s going to get cold,” I said. “I don’t want it to overcook,” she said. Right. It’s warming but not cooking…that makes no sense, does it? 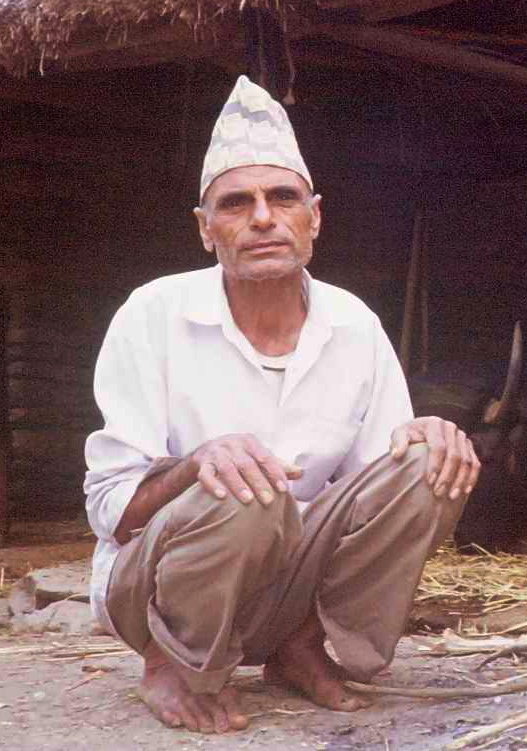 Tuesday morning, we’d only been up for a short time when Bhinaju told me that just around the corner, Shaula dai had gone in to the bathroom this morning, given a shout, and was immobile. At first, from the way Bhinaju described it, I thought Shaula dai had somehow just stopped speaking. But then Bhinaju went over to see what was going on, and when he came back, it was pretty clear that Shaula dai was dead. At first I wasn’t going to do anything. But as I finished packing for our three days in Pokhara I realized that made no sense. To be honest, I still wasn’t sure who Shaula dai was, because I call almost all the men of a certain age simply “dai,” or “brother.” Bhinaju had said, “The one in Deurali, with no teeth,” which could have been a lot of people, and I was sorting through them all in my mind. It wasn’t till Bhinaju and I were walking over and we turned onto the small path that goes around Gita bouju’s house that I realized Shaula dai was Kopila and Kalpana’s father. I chatted with him the other day while he and his wife were tilling corn. At their house, a lot of people were crowded around the yard and in the dirt road in front of it. 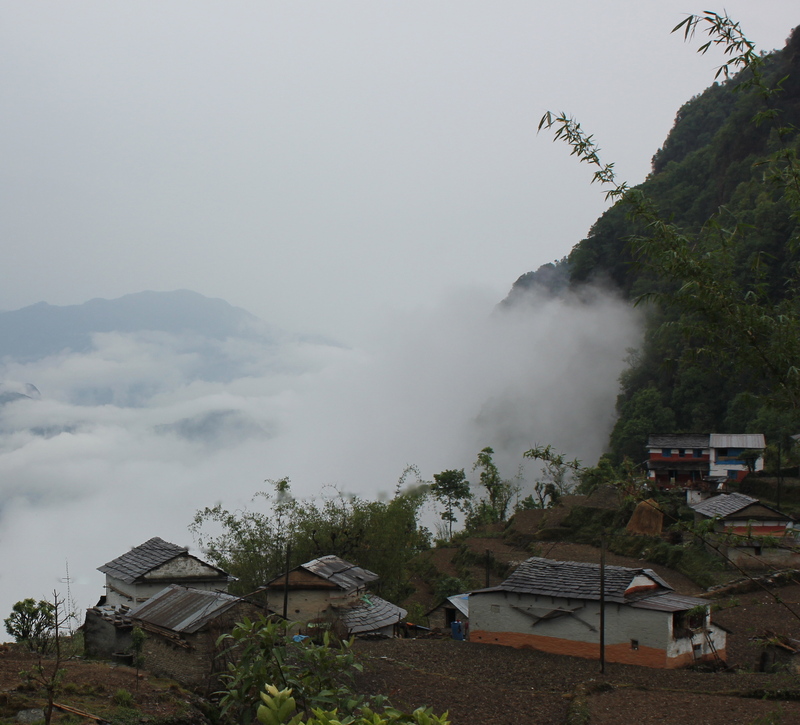 Bhinaju and I made our way up to the porch, where Shaula dai had already been covered in a white piece of cloth. I noticed a curtain was missing from in front of the house door, and for a minute I was fixated on this, the image of someone taking down the white curtain at the front door to cover Shaula dai’s body on the porch, leaving just one flowered white curtain at the entrance to the house. At first, Ujali bouju – Shaula dai’s wife – looked bizarrely nonplussed, standing on the porch, calling out to various people in the crowd. While she was off to the side, I asked Bhinaju if we could see Shaula dai’s face, and unfortunately just then Ujali bouju came to sit by her husband’s head, her obligation until the arrival of a son. Before I could stop him, Bhinaju asked Ujali to pull back the sheet. She did it gingerly, and suddenly her shock and terror were visible in the way she handled that gesture, as if the sheet was on fire. As she tucked it back under his head our eyes locked for a long, confused moment. I didn’t know if it was wrong to look her in the eye like that. As we stood around, phone calls were made. Shiva dai came over and Ujali bouju said not to call any of the kids who are living in Japan. 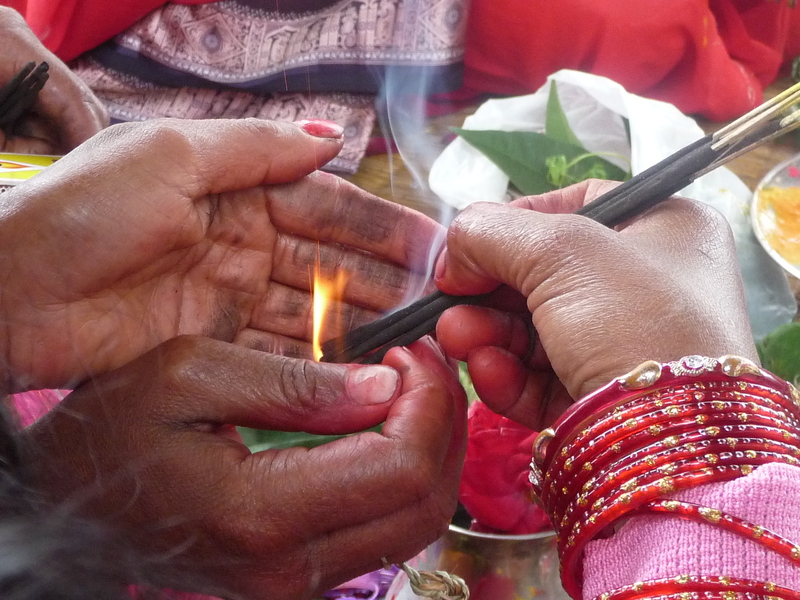 Especially not the girls – there was no way for Kopila and Kalpana to get here in time for the funeral rites. So they were absolutely not to be called. In the way that multiple experiences can suddenly collide and line up in an instant, I recognized Joan Didion’s The Year of Magical Thinking, which I read recently and have been thinking about a lot. As if it made sense not to call the daughters, who should not know their father was dead if there was no way to get home for the funeral rites. As if he could stay alive for them, as long as they didn’t know. Last night, we had a guest in our house. He had wanted to sleep in his own bed sheets, and had arrived with a white sleeping bag liner that was light and suited to the warm weather. He fit right inside of the white liner and lay down on his back, with his legs straight together and hands folded on his chest, and put a pale shawl over the liner, and became perfectly still. Bhinaju and I were sitting on the other bed and he leaned over to me and whispered – Laura – our guest looks exactly the way a dressed body looks – and we both shuddered and couldn’t look at the sleeping figure on the other bed after that. Now, the next morning, there was Shaula dai before our eyes in exactly same posture. Bhinaju leaned over to me and whispered – Laura – our guest just last night – and we both shuddered again. And I realized that Ujali bouju, sitting by Shaula dai’s head, had not even changed out of her red sari, and it was jarring to see the red sari next to the white curtain covering Shaula dai, because white, the color of purity, is the color of death, and the celebratory color red is forbidden to widows. In that moment, I saw Ujali bouju arrested in a transformed world, sitting in her red sari beside the still white covering. Soon, somebody was going tell her it was time to change, and like Aamaa, she would never wear a red sari again. Yesterday, the boy who lives next door to Govinda dai’s house had his bartan, which is kind of like a Hindu Bar Mitzvah (except different). In the evening, there was a bajan, drums and cymbols and chanting that create the most gorgeous and hypnotic devotional music you’ve ever heard. So after dinner, around 9pm, Kaushik and I went over to listen. I was actually tired and didn’t feel like heading out, but I knew that Govinda would be playing in the bajan and I didn’t want to let him down. As we walked up the road, Govinda’s kids Sulo and Sudir came running towards us, and the sound of music followed soon after – driving, jubilant. We turned in to the yard, which had been covered by a tarp. Two men, one of them with a huge belly, were twirling with their hands in the air, amid a crowd of adults wrapped in shawls and children up past their bed time sitting on the ground. The sparkle and joy of it washed over us and my heart lifted. I sat near the bajan for a while with my recorder. Govinda was on the symbols. I have been coveting a recording of this wonderful music with its surrender and elation and praise all wrapped together. Of course, Kaushik and I were both invited to dance. But a lot of the time I was just listening, the night time around us, Sulo leaning on my bent shins and my arm across her chest, like Bishnu and I used to sit. During a break, Govinda left his cymbols lying on the ground next to me. I picked them up and started tinkering. I tried to be discreet but in order to really play devotional cymbols, you just have to go for it; they don’t have a volume control and the physical movement of the hands only works out rhythmically if you play without restraint. So soon I was just playing the cymbols while people chatted and rested around me. But the sound started attracting attention, and them some smiles, and then a woman who’d joined the bajan picked up her cymbols too and matched my chime. So the drummer started, and the next thing I knew, I was playing in the bajan. I was a part of it. The other pieces came up around me like a garden, and until I had to hand the little chimes back over a minute later, the music was coming right from me. This was the fastest trip I’ve ever had to Nepal – I don’t know where it went! Apparently, my Nepal life which was once just in Kaskikot and at a little primary school has been divided in to multiple villages and cities. On the other hand, the more time goes by, the more I find things grow in depth rather than width. As much as I seem to run around, during the last two months I’ve been much more aware of the dimensionality that time adds to the same routines, and it seems more important than any of the cutting-edge details of this project or that. Last week I went with Govinda to visit his father in law in Begnas, because he was diagnosed with terminal stomach cancer in August. I first made the trip to Begnas when Govinda and I were teaching together in 2003, and it became one of our most legendary adventures – we still tell tales of how I climbed in the orange trees, and sat with Bua while he cut vegetables, and we all slept up in a tiny attic–this elderly man insisted on giving me his bed (I was a 23 year old collegiate rower) and he slept on the floor and I could not convince him otherwise. As we were all lying there in the dark, he slowly and carefully asked me questions like, “Nani, Little One, in your country, what do they eat at weddings?” “Nani, in your country, what do the roads look like?” I told him about elevators and the job market and hot water taps. Bua worked as a security guard in India for five years and is not as sheltered as he sometimes pretends to be. But he is the gentlest human being I have ever met and every tiny detail of the world seems to move him. He has a way about him that is intimate and unceremonious at the same time. Most of his wealth from working abroad was lost to loans he made and never demanded back – how would they pay? 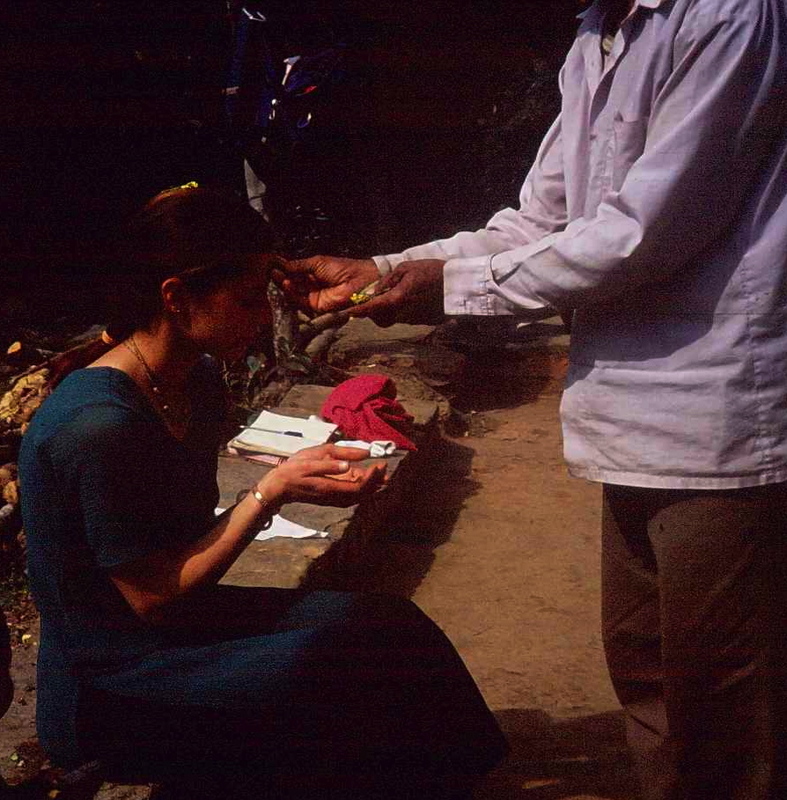 On that magical trip to Begnas with the orange trees, Bua asked to see a rupee from my country and I gave him a dollar bill which he folded in half and put away. 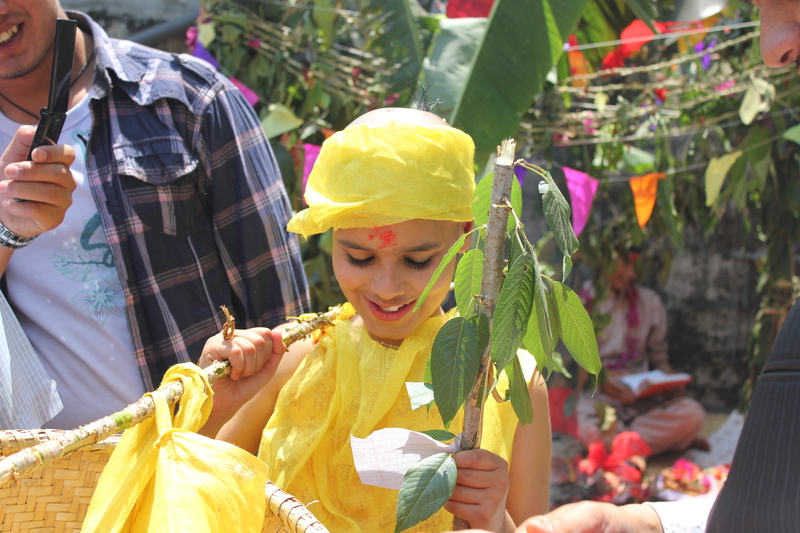 In the decade since, Bua has come to visit me in Kaski every year that I’ve been here. Each year he’s older and more frail but he takes a few bus rides and schleps all the way to Kaskikot, and we never know when he is coming; he just arrives in the yard one morning. Aamaa and I beg him to sit and eat with us before he goes and he always says he has to get home to do this or that. Every single time he says, Nani lai dekhna paeyo, “I got a glimpse of the Little One, I have to go now,” and then he schleps all the way back to Begnas. Once I brought him a poster of a photo of the moon. Last week Govinda and I went back to Begnas to see Bua during his last months of life. 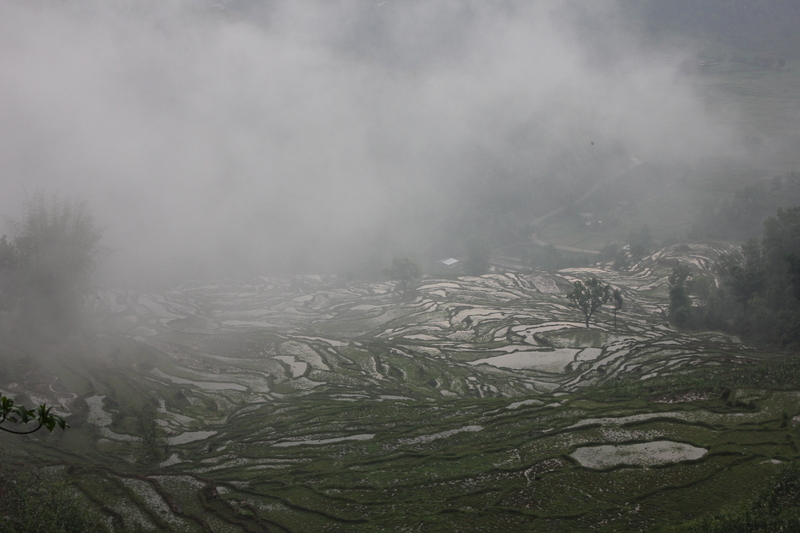 It poured on the walk there and the rice paddies turned to mirrors under the clouds. We spent the night at a relative’s house he has moved in to, in a space over the buffalo shed and under the slant of a corrugated tin roof, which sloped down over our heads and stopped in thin air, leaving an unobstructed drop to the ground and a view out to the hills. The sheltered stone paths and trickling water of Begnas are quiet and patient like Bua, so different from Kaski’s dramatic himalayan perch. He had asked for a light from the U.S. – maybe they make them better in my country – and I gave him a red metallic maglite that he tucked under his pillow. We chatted some, about India, and then we fell asleep. The next morning we got up to leave and Bua walked us down a path from the house to the dirt motor road. He is barely more than the circumference of his bones, but still moves with an elegant deliberateness with no notice of my constant, automatic haste. He stopped on a random set of descending stones in the trees and turned around. He put the dollar back in his pocket, and sent us on our way.